On Friday nights I like to have quick and light dinners, that I can enjoy with a glass of wine and then be off to meet my friends. Last Friday was no exception I wanted to make a fast dinner composed of small dishes so, I met Moos, on his way back from work, at the market and picked up fresh ricotta and Oven Head smoked salmon. I must admit I am somewhat biased against salmon. I think its because I’ve seen it everywhere. So I took a long break from it, but on that particular Friday I was craving its rich, smooth taste. 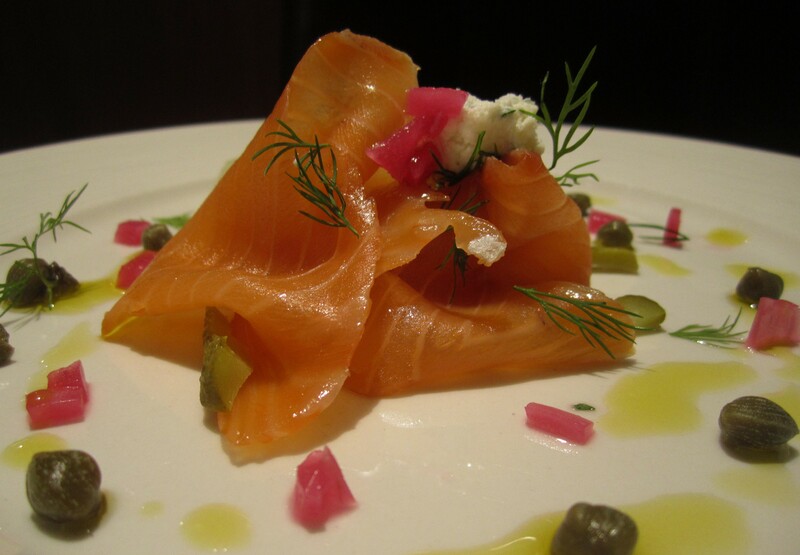 Oven Head smoked salmon is a cold-smoked salmon from New Brunswick. It has wonderfully luscious woody aroma, salty notes and a vibrant color. Our friendly fishmonger allowed us to taste other varieties of smoked salmon he had, but this one won us over. The tangy saltiness and the strong maple-wood flavor mingled beautifully, together. If you don’t have marinated onions then I suggest you start by doing that. Chop half of the amount of fresh dill. In a small bowl mix the chopped dill, Ricotta and 1 tsp of olive oil. Get about 3 cornichons per person and cut them length-wise in half. 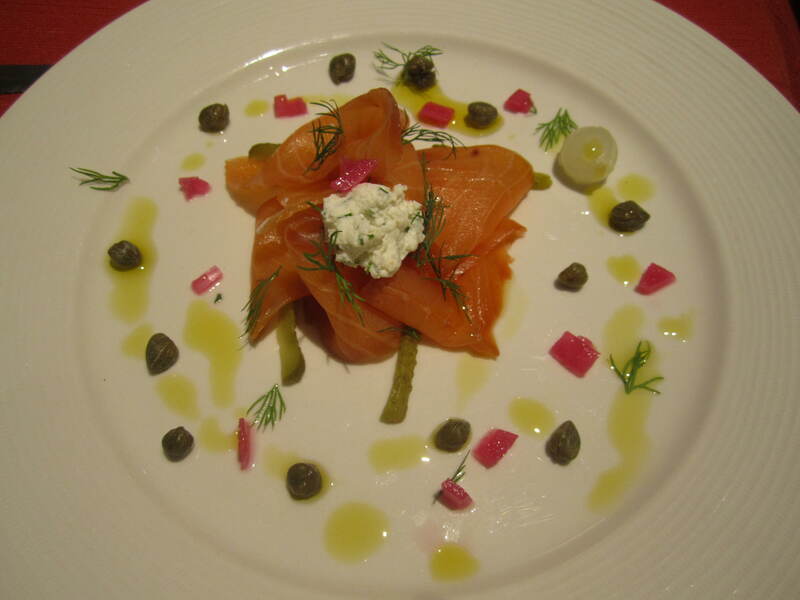 Place the salmon in the center of the plate in a decorative fashion (in folding motions). 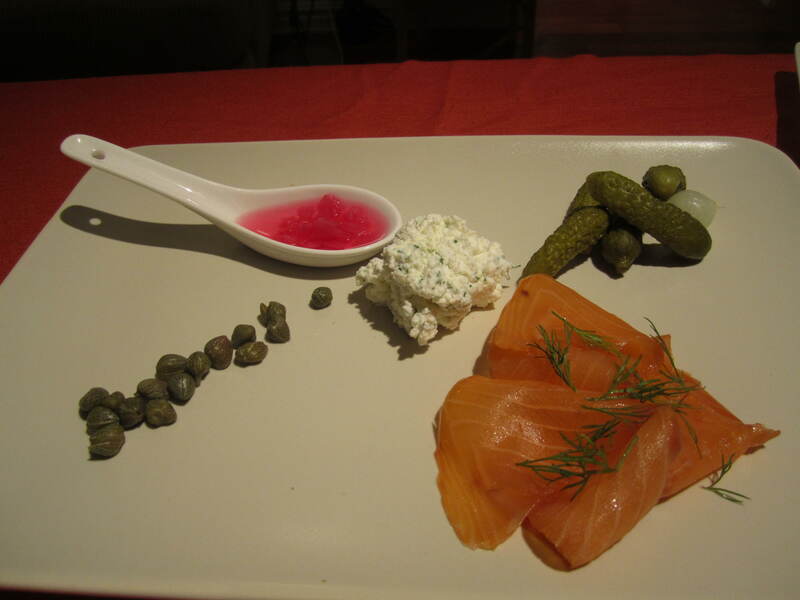 Place some cornichons and capers between the lower folds and around the plate. Put a dollop of Ricotta on top of the salmon and scatter some marinated onions. Finish with a drizzle of olive oil, a sprinkle of fresh ground-pepper and hand-separated dill leaves. 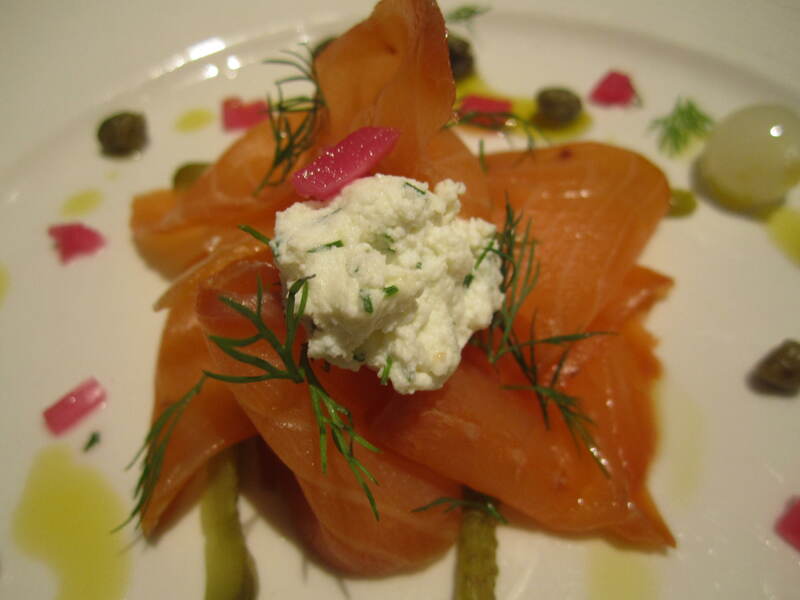 The crunchiness of the cornichons provides a nice juxtaposition against the silky smooth texture of the salmon. The sweet acidity of the marinated onions highlights the woody characteristic of the salmon and cuts the saltiness of the dish. Serve with crunchy toast or baguette on the side. A lot of the times presentation is what does all the work for you. Ps. If you want to see what I did with the left over salmon for bunch click here!